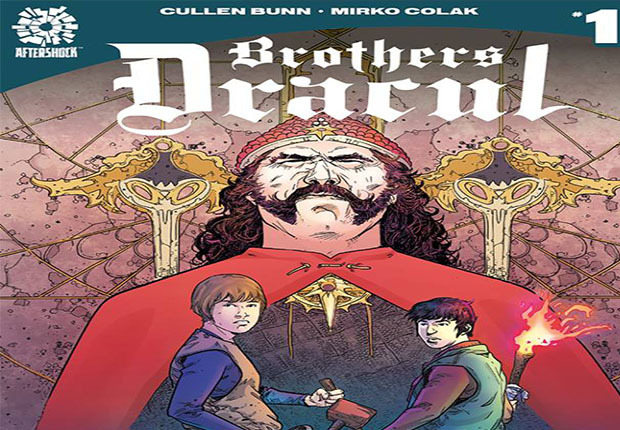 Brothers Dracul – Spoiler-Free Preview Review – INDIE VOLT! When I first read the title of this book I thought sarcastically, “Great, another indie comic playing up the Dracula / Vampire story”. And I would’ve left it at that if I hadn’t seen the writers name, Cullen Bunn ( The Damned, Harrow County, Dark Ark, and a stack of titles from Marvel / DC so large you could choke an alligator plus more). In short, the man doesn’t put out crap. Thus I gave this preview a second look and I’m glad I did. Even though I got a very early, unfinished preview copy I’m really glad I got to see what I did. For one, It is not just some rehashed story about Dracula dramatically terrorizing villagers. This is a story about Vad and his brother Radu in their teenage years and what could have caused them to grow into the enemy-piking-horror-story fuel we know. Cullen and it shows. the expressions on the characters faces convey a lot of emotion that echoes the dialogue and unspoken thoughts through traumatic situations. And, though it wasn’t a lot, some really breathtaking scenic shots of the eastern europian landscape that colorist Maria Santaolalla did a really good job on. I’ve seen similarly laid shots that didn’t pop as much. As I said, this was an unfinished, 11 page, preview copy I had and not the whole first issue, so I don’t feel comfortable issuing a rating for it, but needless to say, if you are a fan of this team’s other works, check it out. I bet you’ll be pleasantly surprised, I know I was. You can pick up this book on comic shelves April 11th.